A simple and versatile garden salad that is easy to make and uses fresh summer ingredients. Peppery arugula, protein-rich quinoa, refreshing cucumber, fresh corn, cherry tomatoes, and sweet bell pepper get tossed with a creamy cashew basil dressing and finished with crunchy roasted almonds and creamy avocado. My favorite ingredient is the fresh corn kernels as they provide a touch of sweetness that whispers “summer has arrived”. 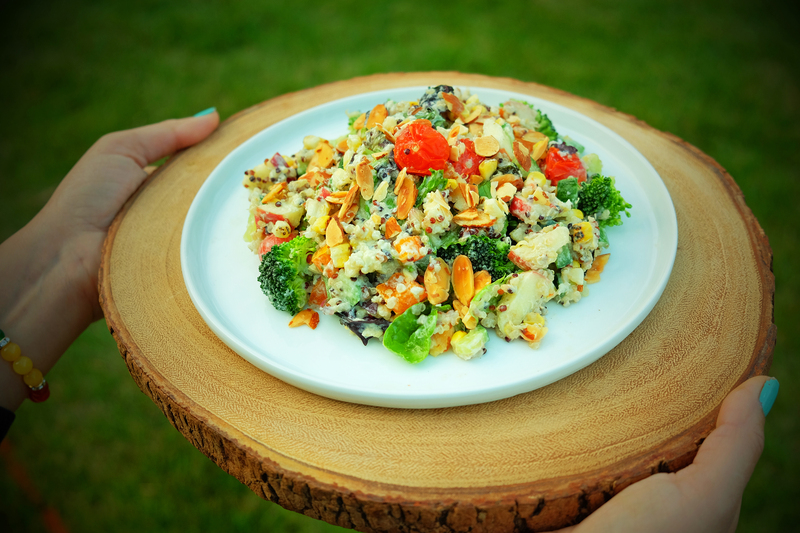 Filling and wholesome, this salad is a terrific symphony of salad greens, vegetables, fruits, whole grains and nuts in one meal. Here’s to a great summer filled with great food! 1. Wash 1/4 cup quinoa. Cook with 1/2 cup water until the quinoa is tender but crunchy (approximately 12-14 minutes). 2. Dice the orange pepper, cucumber, and apple. 3. Cut 1 cup broccoli florets and blanch them in boling water for a minute. Drain the boiling water and place the florets into ice cold water to shock them. This process will maintain their green color. 4. Take a fresh corn on the cob and boil it until cooked. Remove and let cool. Once cool, carefully take the kernells off with a knife. 5. Cut all the cherry tomatoes in half. 6. To make the dressing, blend the cashews, basil, garlic, lemon juice, salt and pepper in a blender (Vitamix recommended) until smooth and creamy. 7. Mix the arugula, quinoa, pepper, cucumber, apple, broccoli, corn, and tomatoes in a bowl. Place the bowl its contents in the referigerator until cold. 8. At the time of serving, mix the dressing nicely and add it to the salad once plated. Garnish with toasted almonds and avocado slices. 9. You can also add of your favorite fruits and vegetables to this salad. Some great choices are strawberries, pineapple, celery, radishes, peas, shaved zucchini, carrots etc.